The previous blog post mentions the discovery of this mysterious company, but I wanted to both summarize what we know and further show what I've found snooping around (which isn't much). As you probably know, during a Lost Season 5 promo music video thingy of "You Found Me" by The Fray, there was a very brief logo there, Ajira. 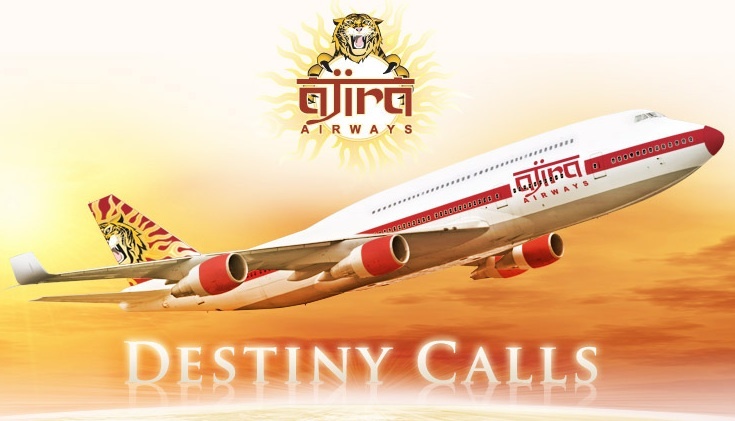 If you visit ajiraairways.com then you'll notice a very cool airplane company with the tagline "Destiny calls" - the same tagline seen on promotional posters for Lost Season 5. Furthermore, the site is launching January 21st - the date of Season 5's premiere. You can sign up to their mailing list, and "discover new ways to get lost in the world." I think one of the most interesting things with this whole thing is that Ajira, as mentioned in the last post, can be transliterated (whatever that is?!) from Hindi to make "island" or "isle". Thinking back to Hans Van Eeghen's final words in his last email, "in the meantime may the spirit of the island guide you" - makes a bit more sense now, and perhaps it wasn't just a flippant let's-slightly-chip-the-fourth-wall thing. Anything else to report? Well there's one thing, but I doubt its significance. I was playing on Google and found a cached version of the Ajira site dated Nov 10th. See it here. It looked normal but I saw "Burky...Call me!" which I thought was a bit weird, especially when Lost executive producer Bryan Burk is known by that nickname. But again, probably nothing, and I'm certainly not trying that number! Update 1 - Lostpedia Administrator Santa added details on the site. Apparently WHOIS lists that it was created October 21st, so thus the cached Nov 10th content I cite was actually added it would seem by the makers of the site. For more info and what Santa got, see Lostpedia's Ajira Airways article. Update 2 - Sorry, another little thing. The WHOIS stuff suggests that the site is being run by LeeLee films. In other words, NOT Hoodlum. This might suggest that Ajira is unrelated to Dharma, as surely Hoodlum would produce the new site if it's from the same ARG project? ARG over, submit Qs to the creators of LOST!!!! Alice in Wonderland read begins!